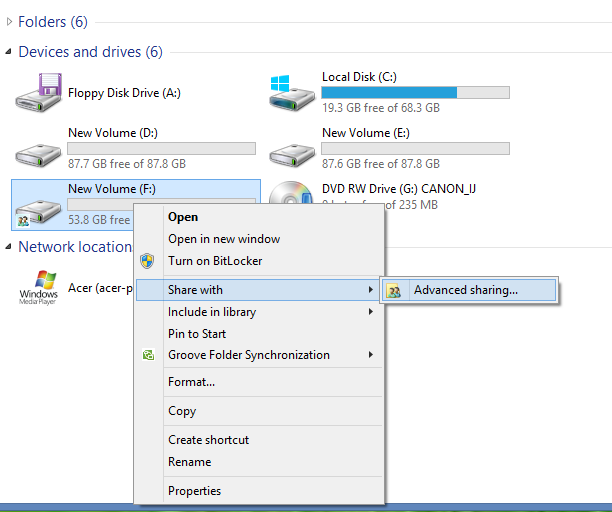 You can share drives, folders and files of your PC to your Computer Network, after sharing these, you can access them from another computers in same computer network. It can be shared for specific computer or for everyone as your requirement. But you should be careful for security of your files, folders and drives while sharing them on the network. Today I am going to describe some methods for sharing drives, folders and files in computer network. You can share your computer drive in computer network, using the following methods. At first Go to "My Computer" from Desktop or Start Menu and Open it. Right Click on the required drive which you want to share and Choose "Share width" and the "Advanced sharing.." As given below. After that, drive properties window will appear, then click on "Advanced sharing" button. That displays advanced sharing dialog box then select on the "Share this folder" check box, give required comments and the share name as given on the screen below. After completing all of these click on OK button. You can share your computer folders and files in computer network, using the following methods. At first, Go to your folder or file and right click on it, Choose "Share with" option and then click on "Specific people.." as on the screen below. 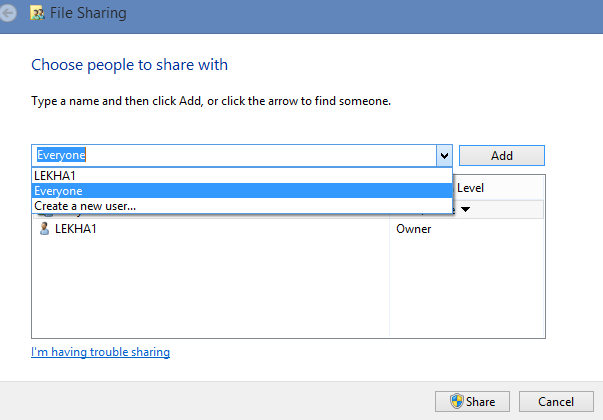 On the File sharing dialog box, choose people to share with, you can select specific computer or can choose everyone and click on "share" button at last. If you want to Stop sharing them on computer network, Go to step 1 and choose "Stop sharing" option instead of "Specific people". After clicking on "Stop Sharing" option, you can see file sharing dialog from where you can choose the option "Stop Sharing" - To remove all the permissions for all the people and "Change Sharing Permissions" option - To add or remove people or change the permission. While changing permissions, you can do as given on the step 2.